2018 Reunification Tour — Dresden, Berlin & Prague! Join me and the newest members of the Traveling Nuest'as — Zelda and Tejomaya — as we head to Europe to meet up with Juli and celebrate her recent graduation from the University of Dresden! While I flew home, Juli was overseeing the third and final stage of Zelda and Tejomaya's make-over at the salon. Zelda, whose hair length was sacrosanct allowed it to be cut several inches. The photos Juli sent immediately after being cut and styled showed a younger and more sophisticated woman. Meanwhile Tejomaya had her hair colored! I thoroughly enjoyed this Nuest’as trip to Dresden, Berlin and Prague. It was three holidays in one, and a very different type of trip than others I've had of late. It was fun having no expectations or set itinerary. It was fun traveling with 2-3 young people ... even if they were unwilling to come out late at night to party in the streets of Dresden! I was grateful for having a few hours here and there to reconnect to my friend Zelda more deeply. I loved all three cities, but especially Berlin, which seems to have an interesting balance of old and new; light and heavy energies, and a level of mindfulness about its past that can either push it towards more compassion or less tolerance. Perhaps it is this last bit that mirrors, in a more objective way, that choice point the US is also experiencing. The last thing I'll say (for now), is that while I really enjoyed experiencing European culture again — especially with a dear friend and god-daughters — my preferred adventures are to places where the cultures are much more different than my own ... where the lines between the sacred and the secular are blurred, and where deep, personal transformation is triggered. But honestly, this was a fun adventure!!! Up early this morning. In fact, it is still completely dark outside. I arranged, last evening, with the desk clerk to order a taxi for 7:30am to be sure of arriving at the Dresden Airport in plenty of time for my 10:30 flight to Frankfurt. This gave me time to shower, dress and pack last minute things without feeling rushed. Another confession: I much rather arrive early and wait, then to feel rushed. The taxi was a “no show” having waited 30 minutes. With plenty of time to spare, no panic. The morning desk clerk called a taxi, which arrived a little after 8am. Check-in at the airport went very quickly — no one else had arrived yet for my flight. After going through security, I headed to the airport café for a hot chocolate and blueberry muffin. The two-hour flight passed quickly, and unlike my flight two-weeks ago from Frankfurt to Dresden, the time between today's connection is two hours … allowing me time to walk to my next gate rather than sprint. At the gate an offer was made to upgrade to Business Class. 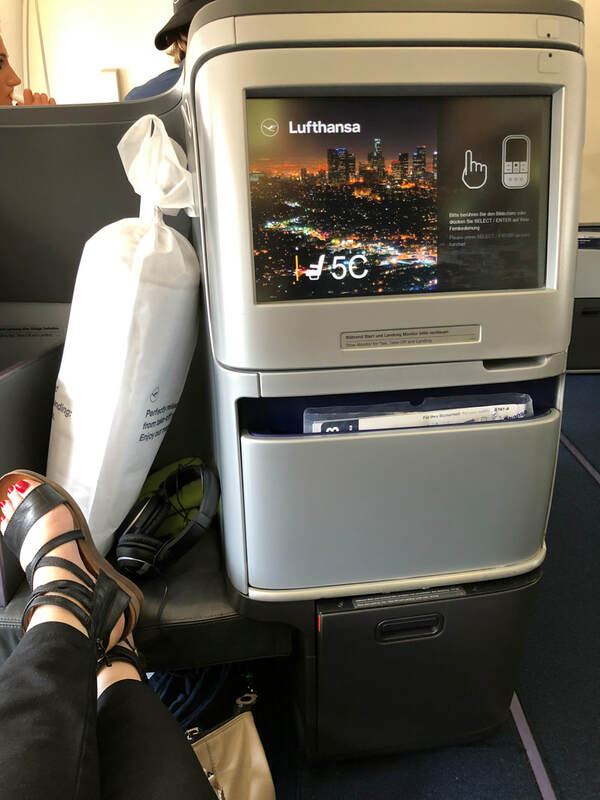 As I was booked for “steerage-plus,” the upgrade cost was just over $200 — a bargain compared to the cost if booked originally. This being the 10 hour leg of my journey home, it was money well spent! After waking and freshening up, breakfast was served. My seat-mate was still asleep. We finally woke as the captain alerted us that we would be landing in 40 minutes. Not wanting breakfast — my seat-mate curiously pulled out of his carry-on bag a cosmetic brush, mirror and a compact of compressed black powder. Looking out the corner of my eye, I watched in fascination as he proceeded to “fill-in” his eyebrows an beard. The latter being pretty sketchy at best. Huh … wonder if all Arab men do that? Landing a few minutes early, I whizzed through Immigration and Customs in time to (thankfully) catch — with time to spare — the early shuttle back to the Santa Ynez Valley. Having called my niece Taylor when I caught the early shuttle from LAX, and again when the Shuttle passed through Santa Barbara, she was waiting for me. After a brief catch-up, I was in my bed by 11pm! Another confession​: I am a morning dawdler ... perhaps because I don't drink coffee, I like to ease into mornings. I like to take time to greet the day — meditate, play solitaire on my iPhone while brushing my teeth, reading a chapter or more of a book while bathing, and slowly deciding what "costume" I felt like wearing for the day. Another gorgeous morning … Per my usual habit, before going to bed last night I packed all but toiletries in readiness to leave Prague today without rushing. Seated on the same side of the train, there were plenty of familiar landmarks to view from the “opposite” direction. Between photographing and reading, the time sped by. I feel a special relationship, based on familiarity, with the town of Bad Schandau and the gorgeous nearby rock escarpment — this being my third passing. Konstantin was there to meet us at the Dresden Train Station, missing his Juli after just about 24 hours. Ah, young love! 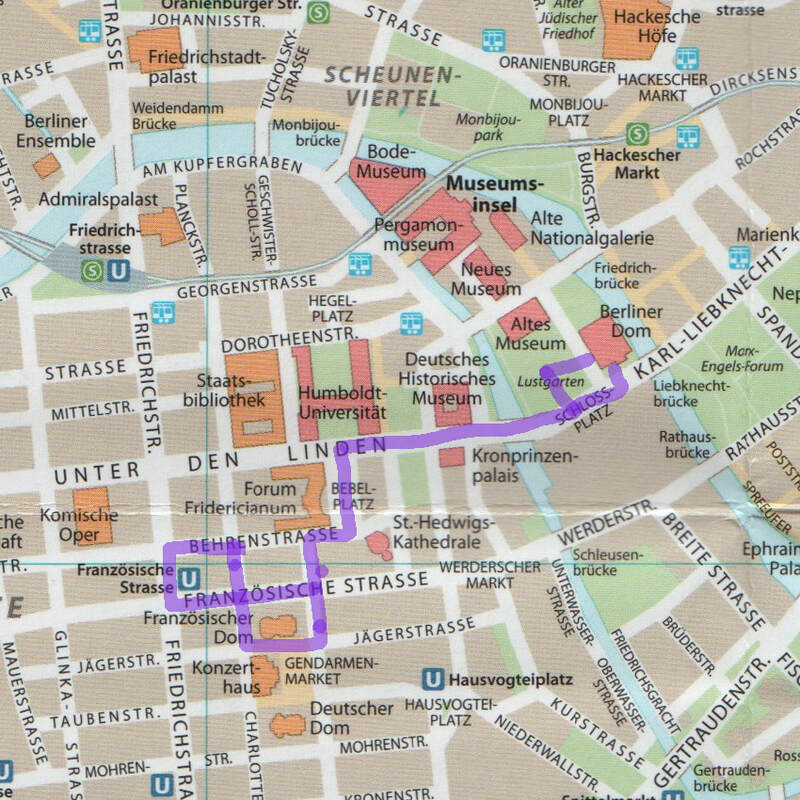 Having sat for more hours than we’ve become accustomed, we opt to walk back to the Hotel Suitess — down Pragerstraße past the Centrum Galerie, across the Külz Ring, through the Altmarkt, across Wilsdruffer to Neumarkt, past the Frauenkirsche to our hotel on Rampischestraße. After settling back in to my hotel room and a bit of reorganizing, I headed down to meet the others for lunch at our “usual” Kurfürstenschänke. Starving, I ordered Hähnchenbrust gefüllt mit Spinat und Schafskäse (chicken breast filled with spinale and sheep cheese on a bed of greens with braised cherry tomatoes and a sesame vinaigrette) and a Wellness-Limonade, which consists of fresh lemon juice, a wedge of lime, ginger, fresh mint leaves and a hint of elderberry syrup. After our late lunch, we walked around Dresden, took photos, window shopped and bought a few last minute treasures. Some, even had enough room for a gelato … not me, still stuffed from yesterday’s calorie frenzy and our recent lunch. That said, on our way back to Hotel Suisse, Juli took me to a Camonas Schokoladen shop across from the Frauenkirche and steps from our hotel. Damn ... I could have been having the most delectable thick, hot chocolates every morning while we were in Dresden! Still way too hot for hot chocolate, I ordered three chocolate milkshakes — no, not all for me — and a box of chocolate truffles for our after dinner dessert. Back at our hotel, the next two hours were spent organizing and packing for my flight home tomorrow. Not very hungry and the temperature still hot, Juli and Konstantin went off to bring back a traditional German take-out meal with wiener schnitzel, potato salad, sausages, cabbage and other stick-to-the-ribs fare, which we enjoyed al fresco on the patio. Perfect. As I have an early plane to catch in the morning, I headed down to the hotel desk to settle my bill and head to bed. Task accomplished, I went back up to my room only to discover my keyless card had de-magnetized. Back down to the lobby to have my card reprogrammed, I headed back up to my room. Alas … the card didn’t work. Down to the lobby for another try … and voila — I was able to get in! 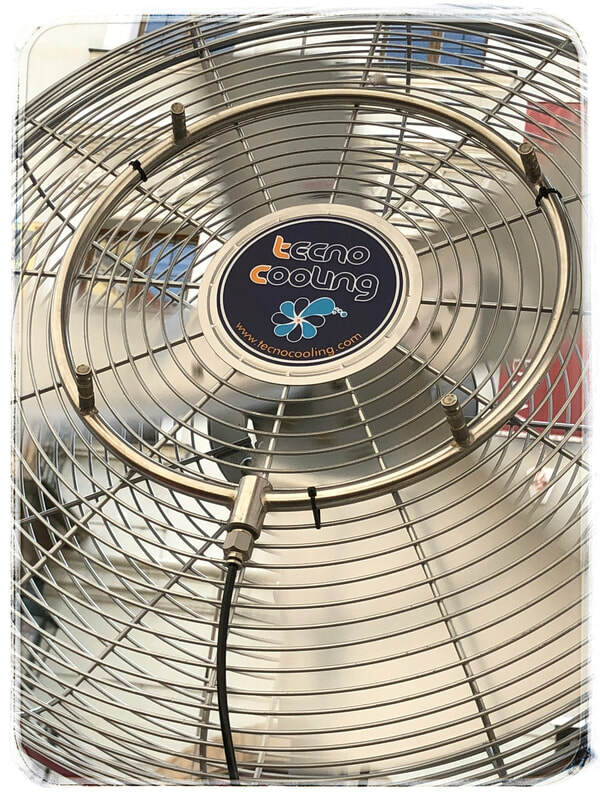 Another quick shower (my third for today), I went to bed with air conditioning on high and visions of a photo sent from my Nuest’a friend Gypsy to ensure a good night's sleep! Another gorgeous day! 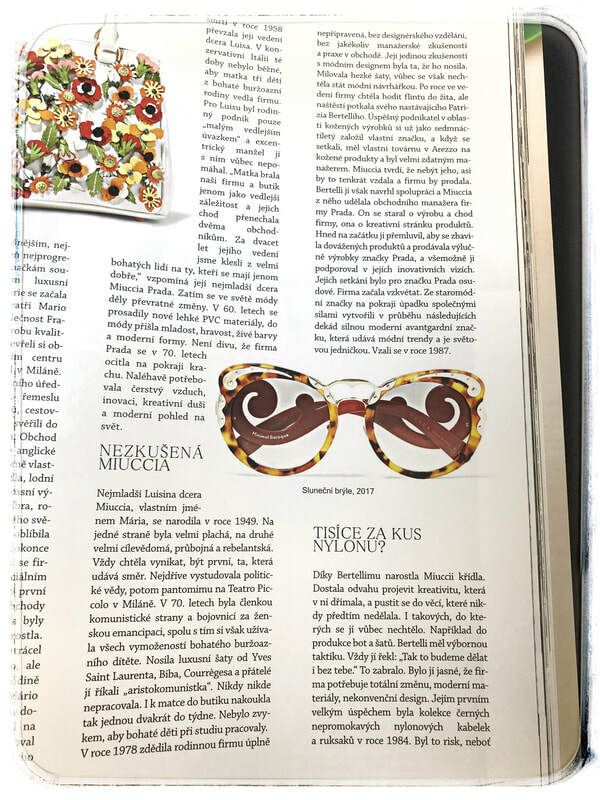 … While dressing this morning I flipped through a magazine in the room with the most incredible eyeglasses by Prada … perhaps this will be today’s quest … or just another impossible dream! This morning Juli, Konstantin and Tejomaya rose early to hike up to Petrin Observation Tower on the other side of the river. Meanwhile, after a leisurely morning of organizing my things, Zelda and I met for breakfast. Once everyone showed up, a plan was made. While the kids showered and changed, Zelda and I start making our way to the Old Town Square where we would all rendezvous. Being of Jewish heritage, they would then go to the Jewish Museum and the Cemetery. We would then meet up for lunch and afterwards they would take Konstantin to the bus station. Taking a more circuitous route to the Old Town Square, retracing many of my steps from yesterday as I meandered through narrow back streets to Dancing House, we found ourselves back at the Golden Crown Jewelry store, where I found the same beautiful amber with coral necklace yesterday. While Zelda tried on a few amber necklaces, I found a pair of earrings for a niece, who is housesitting for me, and another pair for me! Hot and humid again today, Zelda and I sat at an outdoor café and waited for the others. Though still hot, the cafés fans have misters that are really effective. After cold drinks, we crossed through the Old Town Square passing the Jan Hus Monument honoring one of the most important personalities in Czech history and who, one-hundred years before the Protestant Reformation started by Martin Luther, was burnt as a heretic for his reformist ideas. Hus was dean of the Charles University, and in 1410, was excommunicated by the pope for his ideas and criticism of church practices. Despite that, he continued preaching until 1415. In the summer of 1415, Hus was invited to the Council of Constance and asked to renounce his ideas. After refusing, he was burnt at the stake as a heretic on July 6, 1415. Walking up Maiselova, our first stop was a small museum by Maiselova Synagogue that exhibits old Hebew writings and sacred objects, including gorgeous tapestries sewn with gold and silver threads. Around the corner we stopped at the Holocaust Memorial at the Pinkas Synagogue, which is dedicated to the memory of Czech and Moravian Jewish Holocaust victims. Their names and dates of birth and death, which is generally the date of their deportation to ghettos and extermination camps, are inscribed on the interior walls of the synagogue’s sanctuary and adjoining rooms. Adjacent to the Holocaust Memorial is the Old Jewish Cemetery, which is one of the largest in Europe. It includes 12,000 tombstones and many more burials, having served its purpose from the early 15th century up until 1786. During the more than three centuries that it was in active use, it struggled with lack of space. Since expanding the cemetery wasn’t always an available option, it gained space in other ways like adding new layers of soil . So, in some places there are exist 12 layers of graves. Therefore, sometimes new graves occurred over old gravestones to protect the one beneath, and sometimes the older gravestones were elevated above ground — thus explaining the dense forest of gravestones visible today. Overhearing a docent, I learned that there are two kinds of Jewish burial monuments. The oldest are simple, rectangular slabs of stone or wood. Around the 17th century more decorated gravestones came into fashion with ornamental pilasters, volutes, false portals and the like. All gravestones are inscribed with Hebrew letters that tell the deceased person’s name and date of death or burial. Peckish, we head to Les Moules on Parizska for a delicious lunch — oddly, I was the only one who ordered mussels, which I adore. Their mussels are cultivated in the middle part of the west coast of Denmark on lines about 500 meters offshore — and “there is never more than 12 hours from the time they are harvested to being served. 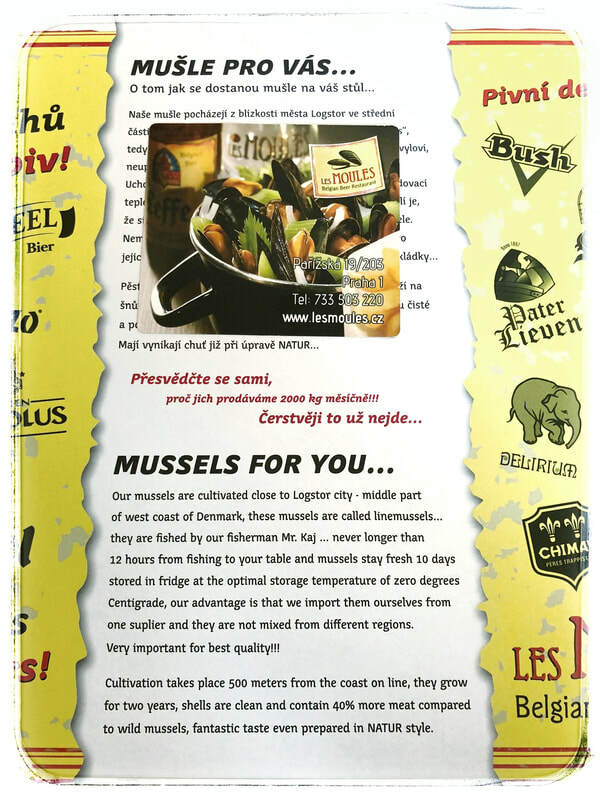 Les Moules offers 12 ways their mussels are prepared ... and according to information provided, customers consume about 2,500 kilograms every month! There are many other seafood and non-seafood things on the menu, and if we weren’t leaving the next day, I’d be back to try many more. However, a mussel connoisseur, I choose mussels with garlic and white wine with pommel frites and a baked herb baguette — delish!!! After lunch Tejomaya and Juli walked Konstantin to the bus station for his trip back to Dresden. Meanwhile Zelda and I strolled down Parizska — the Rodeo Drive of Praha (Prague). Funny to see pencil thin young women wearing designer clothes (perhaps they work in the boutiques) and stiletto shoes on the cobblestone sidewalks and streets! Finding ourselves back at the Old Town Square, we headed back to Dancing House, through narrow, windy streets and past wonderful graffiti. Getting turned around, we discovered our approach was from the same direction as when arrived two-days ago! After freshening up a bit and grabbing reading material, Zelda and I walked along the Vltava River to Most Legii (Bridge of Legions) to Streleckeho Ostrova (Shooters Island) for cold glasses of lemonade. This island is one of a system of island parks in the Vltava River. First mentioned in the 12th century, this island was home to the monastic order of Johanitas in the 14th century. Sitting on the upstairs terrace of a café across the river from the National Theatre, we watched as peddle boats filled with families, young people and older couples floated by. We watched the National Theatre turn golden in the waning sunlight. After several hours of chatting and people watching, we walked over the last section of the Bridge of Legions, alongside Devil’s Stream and the Dutch and French Embassies. Still hot and humid, we even stopped in "Sweet Dream," one of the shops that make the conical donut ice cream cones — trdelník — filled with a softened vanilla or chocolate ice cream and/or whipped cream that I’ve been eyeing since Dresden. When I asked for all three, the man looked at me like I was insane … I clearly was because by the time I reached the lower chocolate layer, it was oozing out the “cone” all over me! Good thing really as the caloric count must be staggering! Crossing over the Charles Bridge as the sun was dipping low, we worked our way back to Dancing House vowing to not eat again until Dresden. 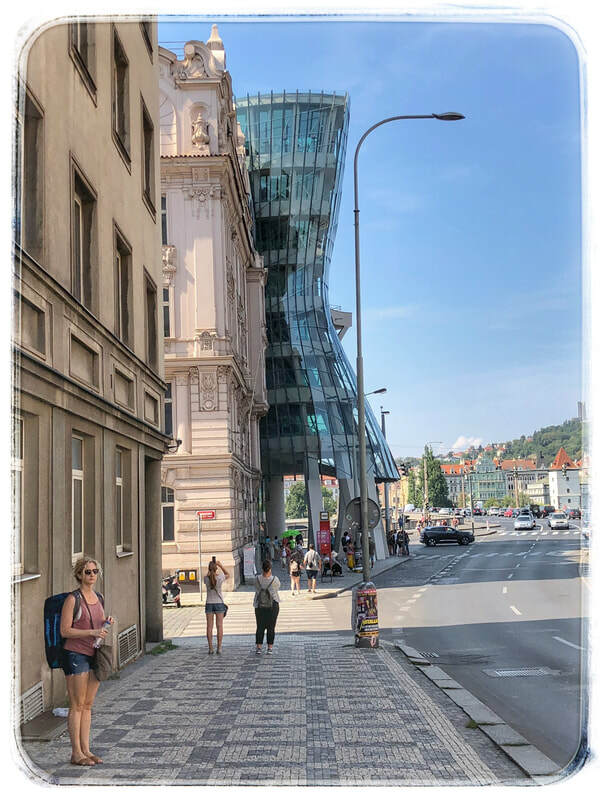 A few text messages back and forth, as we were walking back to the Dancing House, revealed that Juli and Tejomaya made dinner reservations for our last night in Prague at the Fred and Ginger Restaurant — in less than an hour. I wish I could say I didn’t eat dinner. My plan going up the elevator was to have a glass of wine. My second plan was to have a glass of wine and a bowl of soup. My final plan was to have a glass of wine and a hamburger (no bread) and pomme frites. Got to shave off some calories ... Hey, it was our last night in Praha — and I have been averaging 6-12 miles of walking a day … and I’m on holiday … Cheers! Confessions: I love small boutique hotels … I love hotels that have breakfast included … I love having someone make up my bed everyday (other than me) … I love exploring narrow streets and small shops … I love people watching while sitting at a sidewalk café ... I love not needing to be anywhere at a given time! Still sitting on the terrace by the time Tejomaya, Juli and Konstantin arrived, we made plans for the day ... stop at a couple of boutiques before lunch together at Café Louvre — yes, it was so good yesterday we wanted to go back — do our own thing in the the afternoon, and meet in Juli’s room at 5PM to get dressed up and “glamorous” for Zelda’s birthday dinner at Manu — an Italian seafood restaurant — which is on the opposite side of the Vltava River from our hotel and my gift to her. Our first stop was Galerie E. Daniely — an owner-clothes designer boutique we passed twice yesterday. There were several interesting garments for a figure quite unlike mine, but I did manage to buy a skirt that is very different from what I generally wear. Question is, will I ever wear it or is it a frivolous purchase? Time will tell . . . Peckish, we beeline through back streets to Café Louvre (Narodni 116/20), passing by wonderful architectural buildings — some with whimsical sculpture embellishments and colorful graffiti art. At the restaurant, I ordered the incredible vegetable pancakes served with sour cream — it is one of my favorite new foods! Satiated, we walk a few doors down before getting pulled into a shoe store advertising a sale . . . there are some screaming deals on Pikolino boots, but it is way too hot and humid for me to even think about trying a pair on. 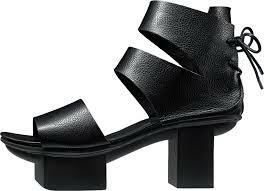 Zelda goes for it and purchases a pair of stylish above the ankle boots and dress sandals — birthday presents to herself. Across the street is Pietro Filipi, another designer boutique with two floors of beautifully made clothes. Here, I purchased a top and a long, pale blush sweater coat. Shopped out, I split from our group and headed towards a small park near Our Lady of the Snows Church and Wenceslas Square in search of young designer fashion stalls. I found only one interesting tiny leather shop. Heading towards the Old Town Square and Astronomical Clock, I weaved in and out of small streets that lured me with interesting architecture and shops. I poked my head into a jewelry store with stunning amber jewelry, a chandelier store with large crystal chandeliers and sconces — some gorgeous and others incredibly gaudy ... even for my taste! Walked past the Estates Theatre and found, without looking for, an incredible high-end haute couture designer boutique — Blanka Matragi — at 110 00 Prague 1-Old Town. Trained as a glass artist, sculptor and fine artist, she has designed gowns for Jennifer Lopez and many other celebrities worldwide, as well as ready to wear, rugs. Hot and thirsty, but literally with no Czech karuna in my wallet, I began looking for money exchange shops. Most in this area offering terrible exchange rates, but I did find one with better rates, and funnily near the Old Town Square. Having found my way to the Old Town Square, a lovely sidewalk café beckoned me with an ice cream sundae with warm raspberry sauce and whipped cream along with a bottle of cold water. Here, across from Tyn Church, I people watched and answered emails until I felt sugar and water revived. Stopping to admire the 600-year old Astronomical Clock, which sadly was shrouded behind a transparent blue construction material and scaffolding due to maintenance, I read about one origin legend says that an experienced clock master, now as Hanus, was selected by the city councilors of Prague to produce an original device that would measure time as well as a few other functionalities. Fearful, that Hanus might produce a similar-looking clock for a rival city, one night they sent some thugs to break into his more to blind him with a chunk of iron. Knowing who was behind the dastardly deed, Hans took revenge, with help from his apprentice, and made the clock stop. More than 100 years passed before the clock was brought back to life. In actuality, information about the clock was discovered in 1961. Its creator was Imperial clock-producer Mikulás of Kadan. He created the Astronomical Clock in 1410 with the help of Jan Sindel, an astronomer and university professor. During it’s history, the clock has failed a few times and needed to undergo maintenance. Officials even considered replacing it during the late 18th century when no one knew how to fix it. The long needed repair came decades later, around 1865, when the Calendar Dial was added. The Prague Astronomical Clock is one of the most famous clocks in the world, the third-oldest of its kind, and the oldest one still in use. Generally, a few minutes before the hour scores of people gather in the square to witness the procession of the 12 apostles on the lower dial as, simultaneously, some of the surrounding sculptures are set in motion. 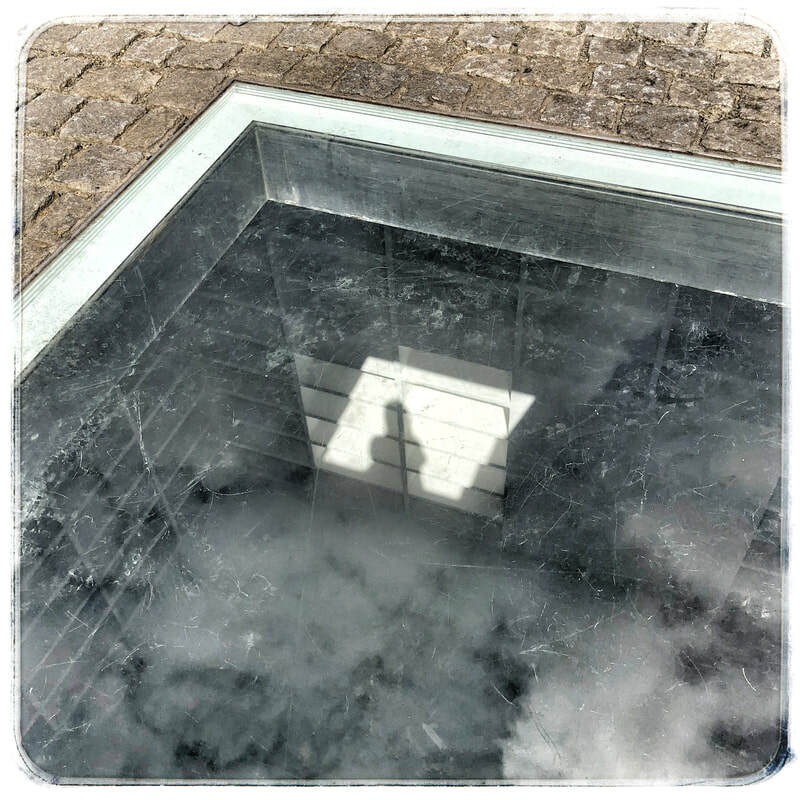 One of the moving sculptures holds an hourglass personifying Death; another has a mirror that represents Vanity. Other stationary figures represent the Astronomer, Philosopher, Chronicler. 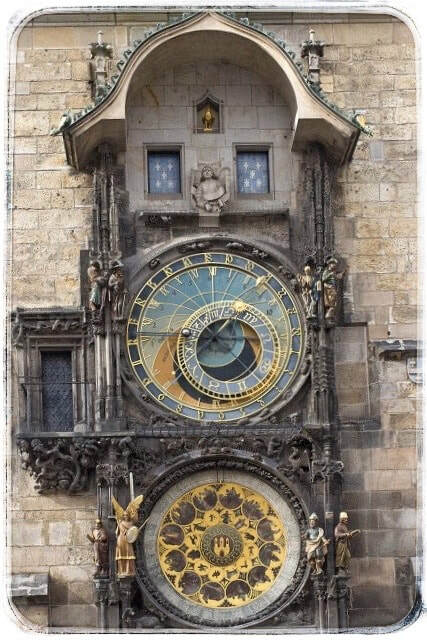 The Astronomical Dial is most likely the oldest clock component and one of the reasons the Prague clock is unique. It illustrates how people of the medieval era observed the universe. The Earth is represented in the center. The bits of blue on the dial represent the skies above the horizon, and the brownish bits depict the skies below the horizon. Inscribed Latin letters indicate which side is East and which is West; North and South are described by denotations for “above” and “below” the horizon, and marked with Latin words for “dawn” and “twilight,” respectively. The circle of zodiac symbols represent the start above, while the clock hands point to the symbols of our closes stellar bodies — the sun and the moon. The three sets of dials count three different time — Italian time or what would be Old Czech time; Central European Time measured by the sun pointer (1 to 24); and Babylonian Time, where the hour’s length is determined by which season of the year it is (a longer hour in summer; shorter in winter). 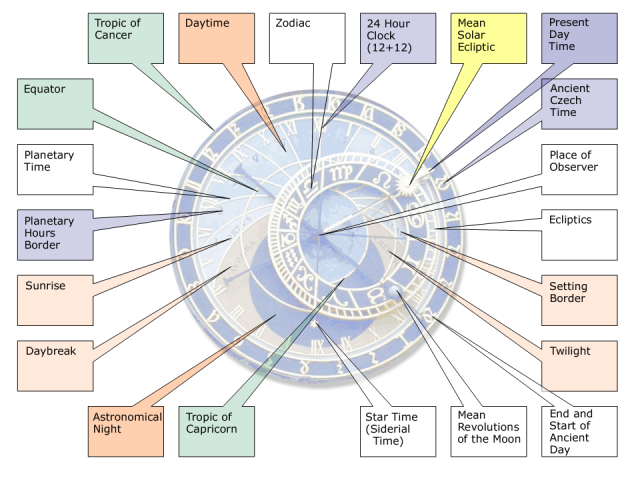 ​The Calendar Dial has fewer functionalities. At its center is the symbol of the Old Town of Prague. The golden medallions depict each month as represented by a zodiac sign. The next ring of medallions illustrates each of the 12 apostles, and its outer ring describes each day all year round. Time, literally running out before I need to be at the hotel for Zelda’s pre-birthday party glam-fest, I wander the backstreets to the Dancing House. Not waking further than a few hundred feet from the Astronomical Clock, I find myself drawn into Golden Crown Jewelry (457/13 Staré Mesto), where I purchased a lovely black and yellow amber with red coral necklace. Back at Dancing House, things got confusing about when to meet to dress and put makeup on for the evening. Champagne glasses in hand, we sang “Happy Birthday” and watched as Zelda opened her gifts. After Face-Timing with Zelda's husband on the phone, we walked across the Jiraskuv Bridge to Manu Resto & Lounge, an Italian restaurant on the river specializing in seafood, for Zelda’s birthday dinner. The food and drinks exceeded all of our expectations, finicky eaters that they are! Humorously, while we were eating our fabulous meal, Zelda's husband sent us the pitiful meal he was contemplating ... ! Full from dinner and tired from walking many miles in the heat, we made our way back across the bridge to our hotel and bed! This morning we are up early to catch our morning train to Prague. Juli and Konstantin meet us at the station — Juli to leave with us and Konstantin to see his mother off on a train home. The first 30 minute stretch is a repeat of our unanticipated train ride to Bad Schandau, when two-days earlier the Asian family pushed their way into our train compartment preventing Juli, Tejomaya and I from disembarking in Dresden. The ride is mostly through beautiful countryside, small towns and a few slightly larger ones. We are four quintessential tourists . . . Zelda and I pulling and pushing our suitcase while Juli and Tejomaya carry their backpacks. Only Juli knows how to pack extremely few things in a very small backpack and still look extremely stylish for three-days . . . Teach me!!! To make our schlepp more humorous, the sidewalks in at least this section of Prague are all cobbled. I especially love/hate the small black and white cobble sidewalks! The walk is architecturally inspiring with Baroque, Gothic and Art Nouveau buildings. With possibly some exaggeration, we walked about 5 miles — down Wilsonova to Legerova, stopping to exchange Euros for Koruna, then past the State Opera House and National Museum, turning right on Jacna through Charles Square and to Resslova — to Dancing House, which would be our “home” in Prague. “Dancing House,” was collaboratively designed by architects Frank Gehry (Canadian-American) and Vlado Milunic (Croatian-Czech) in 1992 and completed in 1996. The very non-traditional design was controversial at the time. It is situated where a former multi-story house was destroyed by the U.S. bombing of Prague in 1945. Next door, a house still remaining was co-owned by former Czech president Václav Havel's family and where he lived for decades. Havel enthusiastically supported the non-traditional and controversial at the time structure that was intended to be a cultural center for the area. Originally named the “Fred and Ginger” building, by Gehry, after the famous dance partners Fred Astaire and Ginger Rogers due to its resemblance of dancers. He discarded that name at it became simply known as "Dancing House". After checking in, sorting out rooms, and freshening up, we hit the street in search of Café Louvre, which Juli had previously dined on a trip here with Konstantin. The restaurant as well as Dancing House were also on my list of things to experience in Prague. Walking along the east bank of the Vltava River up Masarykovo Nábrezi, we skirted the National Theatre to Narodni (street). 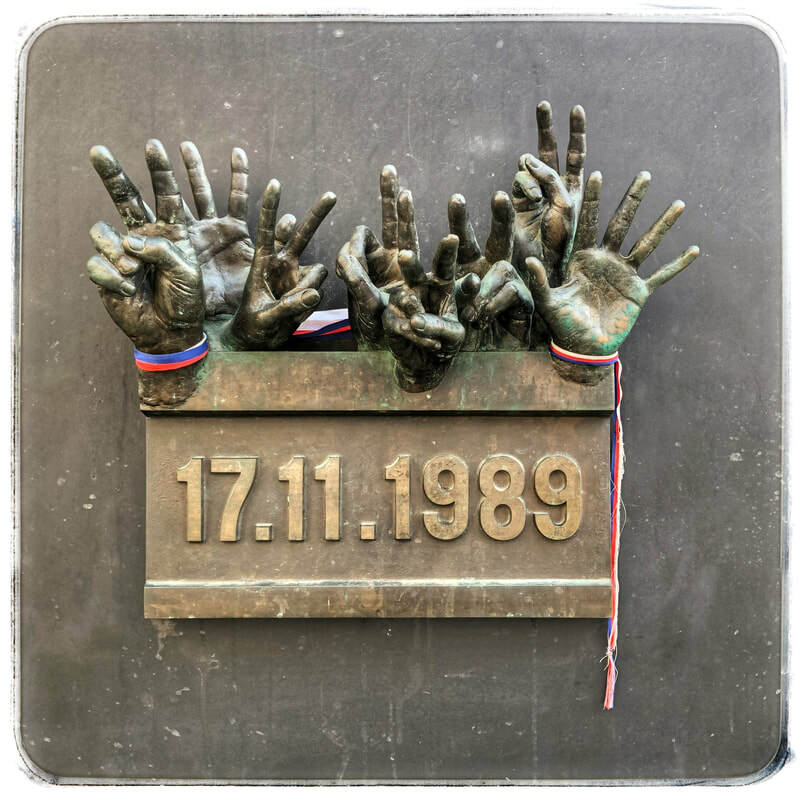 On Narodni (street) we pass an interesting three-dimensional sculpture of hands reaching above a date (17.11.1989) that commemorates the Day of Struggle for Freedom and Democracy, which began with riot police suppressing a student and older dissidents demonstration and ended with the toppling of the communist regime. Known as the Velvet Revolution, this non-violent transition of power took place on the 50th anniversary of a violent demonstration that occurred here against Nazi occupation. Over the next 6 weeks, the Communist Party of Czechoslovakia relinquished power and dismantled the one-party state, sections of the Constitution were deleted that had given Communists a monopoly of power, barbed wire and other obstructions were revoked from the border with West Germany and Austria, and Václav Havel was elected President of Czechoslovakia. In June 1990, the country held its first democratic elections since 1946 — how the courage and commitment of these people is inspiring! As hot and humid here as in Dresden and Berlin, our freshening up didn’t last long. By the time we reached Café Louvre (Narodni 116/20), we were ready for cold beers and food! The Café was founded in 1902 and “since its opening has represented the pinnacle of Prague café society and has been a centre of cultural life.” It is Art Nouveau in style and was frequented by Kafka and Albert Einstein in their day. Jazz Club Reduta next door, drew my attention — though no one else seemed interested. The Louvre serves traditional Czech cuisine for breakfast, lunch and dinner, and respecting the tradition of coffee-houses, you can borrow chess and checker games or play billiards on the five tables in its Billiard Hall. By the way, the food was excellent — vegetable pancakes, homemade quiche and a fabulous chocolate cake! [Sorry no pics of food ... too hungry! Fortified, we are ready to continue our Juli-guided walking tour of Praha (Prague). She suggests crossing the Vltava River by way of the Bridge of Legions for the best view of the famous Charles Bridge. Built between 1357 and the early 1400s, by King Charles IV, the bridge replied the old ​Judith Bridge (mid-1100s) that was damaged by a flood in 1342. Until 1841, it was the only bridge crossing the river Vltava. Spanning 2,037-feet and nearly 33-feet wide, it was built in the “bow” style with 16 arches shielded by ice guards. It has three bridge towers — two on the Lesser Quarter side and one on the Old Town side. The bridge is decorated with 30 statues, most in the baroque-style, that have all been replaced since 1700 by replicas. I love cities that are bisected by rivers like Dresden, Berlin and Prague. Perhaps because that is not the case, but could be, where I live in California. The Vltava is alive with barges that use the extreme west bank to navigate through locks and the majority of the river between the Charles Bridge and the Jirasküv Bridge is alive with pedal boats, kayaks and canoes with locals as well as many tourists. The Lesser Quarter side of the river that we explore is made up of narrow twisting streets and alleys. There are lots of shops — including artisan galleries, clothing boutiques, cafés, ice cream, and cheap touristy souvenirs. Hot and very thirst (again), we stopped at Café 22 for lemonades in the shadow of the gorgeous Church of Saint Nicholas. The Church of Saint Nicholas was built in the late-Gothic and High Baroque styles between 1732-1737, and sits on the site of an earlier Gothic church dating back to the 13th century that was also dedicated to Saint Nicholas. Mozart played the church’s main organ during his stay in Prague — it has over 4,000 pipes! It is said that Mozart finished his overture for Don Giovanni while saying with friend and composer Frantisek Dusek and his wife Josefina. Formerly used as the Czech and Slovak Orthodox Church, Saint Nicholas Church has been the main church of the Hussite, a Christian offshoot of the Catholic Church, since 1920. It serves as a well-known venue for classical concerts presented in Prague. Tired, hot and hungry, it was time to head back to Dancing House. Back at Dancing House, Juli’s room was changed to an incredible deluxe suite for one-night only — sadly it is not until tomorrow night that her Konstantin arrives. Complete with a large hottub-size bathtub, 180-degree curved windows, we ordered in room service, danced and otherwise party-down until our eyes couldn’t stay awake any longer. A note about my room — spacious, very comfortable and modern, great views of the Vltava River and Jirasüv Bridge, it has recessed chromotherapy lighting that one can dial the mood they prefer . . . I’m going to sleep with a soft purple hue! DAY 10: Dancing in the Street (Again)! Slow start today, as last night was all about dancing and partying. Even the weather, with its big puffy clouds, supports lingering in bed until 9AM. Running late, I head to Zelda’s apartment to make a protein shake. The other aspect of today is commotion . . . due to the reason we returned to Dresden, rather than going from Berlin directly to Prague . . . is that Konstantin’s mother is arriving by train to visit. In the continuing quest for epic “hair” . . . we walked Tejomaya back to the salon for her second hair appointment — this time for a cut and style — past a newly married young couple. Afterwards, Juli and Konstantin ran errands buying cheese, crackers and fruit for this evening, while Zelda waited on the maintenance man to fix the washing machine. I headed back to the Hotel Suisse to pack for tomorrow’s trip to Prague and find out from the concierge about a bottle shop to purchase "sweet Portuguese red wine" for tonight. Running out of time, Juli and I run over to the Weinkontor in the Altmarkt, which has an excellent wine selection. The sommelier recommends Condado de Haza Crianza, which is 100% Tempranillo grapes and produced by the Fernández family, one of Spain’s first chateau-style wineries that has been making wine for more than forty years, with a focus on sustainable farming practices and preserving the regional biodiversity, in the Ribera del Duero region. Additionally, I spotted a New Zealand Craggy Range Sauvignon Blanc, one of Rick’s and my favorite North Island New Zealand wineries, which we visited several times along with their excellent Cellar Door restaurant. Back at Hotel Suisse, there are only a few moments to quickly shower and change before heading up to Zelda’s apartment to meet Konstantin’s mother Margaret over wine and cheese. She is delightful, an accomplished doctor specializing in treating children with autism, and has a fun sense of humor. 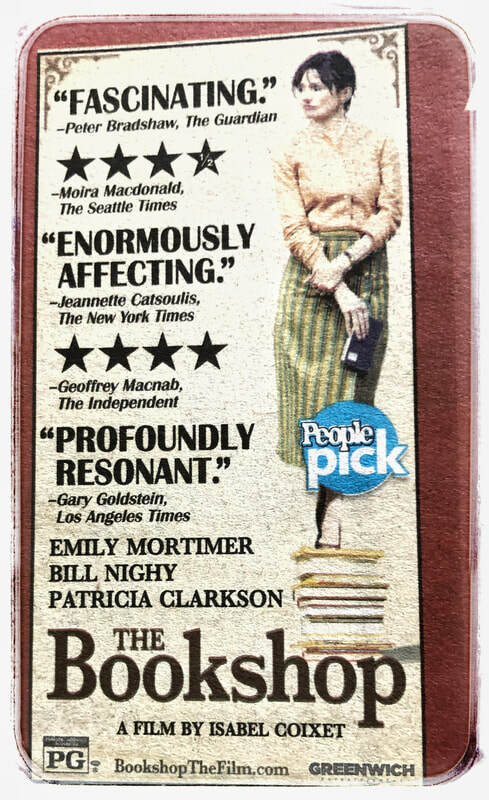 And, an endearing conviction that once her boys went off to college, they were on their own financially . . . so now it is her time to enjoy life. She shared stories about a very recent girls trip to Siberia! By the way, the wines were wonderful . . . The Condado de Haze Crianza was a rich garnet red color, with notes of ripe berries accented with touches of spice and violet. The Craggy Range Sauvignon Blanc was sourced from grapes from their Te Muna Road Vineyard, the wine was influenced by the vineyard’s limestone soil, along with hints of fresh herbs and lime citrus on the nose, and nectarine and tropical melon fruit flavor on the palate — makes me want to return to New Zealand! 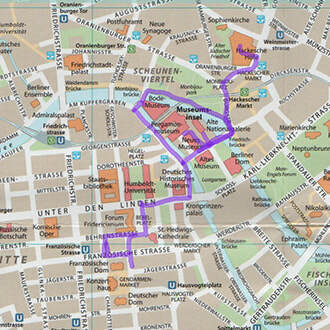 Afterwards, we walked towards the Altmarkt to Steak Royal for dinner. To be absolutely honest . . . even though I ordered a grass-fed petite filet, it was not nearly as tender as the organic beef raised in Montana. That said, it was good to have red meat, the conversation was lively, and the table of men celebrating a bachelor’s party was entertaining! On the way back to Hotel Suisse, we passed once more through the festival now in full swing in the Neumarkt. Back up in Zelda’s apartment, we had dessert that Margaret picked up on the way back to the hotel. I left early to finish sorting and packing for our train ride to Prague in the morning, but within an hour or so was pulled outside to the live rock music playing in the Neumarkt and stayed until nearly 1am — this Neust’a loves to dance! DAY 9: Last Hours in Berlin — Back to Dresden! Finished packing. Drop my bags off at Zelda’s room, then she, Juli and I head to breakfast once again at Amici. While eating, we make plans for our last few hours in Berlin. Juli and her mom Zelda are off shopping — back to the Gudrun Sjödén boutique (Markgrafenstraße 32) and then a few other shops once Tejomaya is up; I am off to the Berliner Dom, which I have been wanting to see inside. With further plans to rendezvous at the Annette Görtz boutique (Markgrafenstraße 42). The walk to Museum Island has become very familiar as I head down Behrenstraße to Bebelplatz; then right, past the Deutsches Historisches Museum and over the Spree to the Lustgarten in front of the Altes Museum (across from the Schlossplatz and the Hohenzollern Palace), to the Berliner Dom. People are queued up to purchase tickets from a vending machine. Standing in line, I watch closely as the family in front of me makes their ticket choice, inserts a credit card and receives their tickets. I feel confident when it is my turn. Placing my credit card into the slot, I make my choice and wait . . . and wait . . . and wait for my ticket to appear. An Asian man behind me taps me on the shoulder gesturing to be patient just as it appears. Becoming frustrated that my credit card does not “pop” out of where I had inserted it, the man reaches past me to “fish” it out manually as it is barely visible. Whew! I smile and nod at the man in gratitude as I walk away — how technically inept I have modeled Americans to be! The Berliner Dom is a magnificent cathedral as well as the largest and most lavish church in Berlin. Built during the reign of Kaiser Wilhelm (1888-1918), this Protestant church was designed by Julius Raschdorf and built between 1894 and 1905, shortly after Germany had been united (1871). 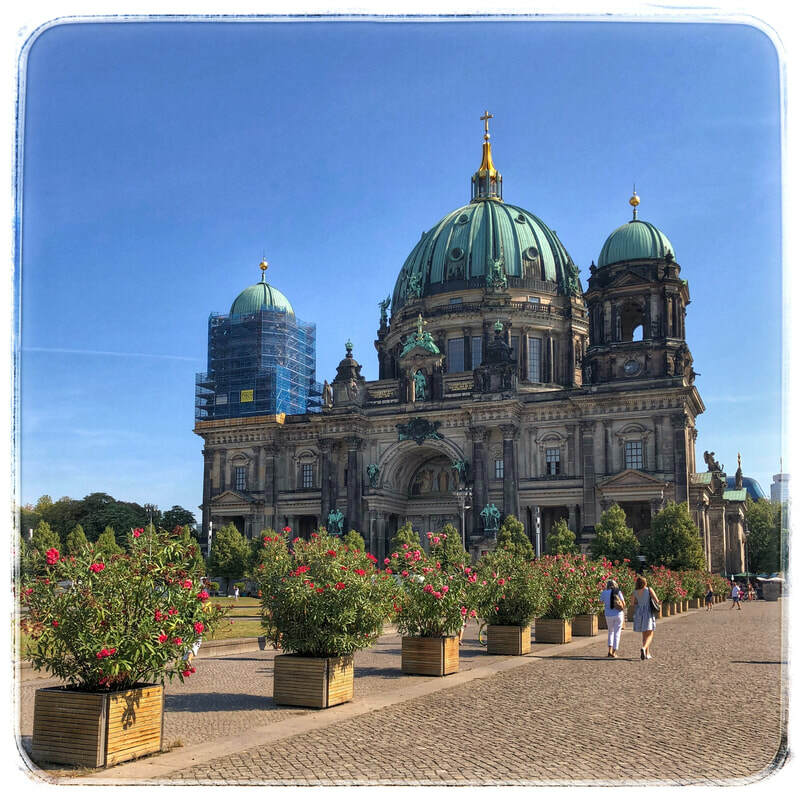 The emperor’s intention was to give his capital stature and legitimacy, and the Berliner Dom’s architecture reflects the empire’s aspirations to power combining Neoclassical, Neo-Baroque, and Neo-Renaissance elements with stucco and gold-tiled mosaics. Damaged during WWII, after almost 40 years of restoration work the church was reopened in 1993. Highlights of the church include its main nave that is capped by a 279-foot high dome, a 20th-century Neo-Baroque pulpit, a huge Sauer organ, the ornate tomb for Frederick I (Frederick the Great’s grandfather). After climbing up several flights of stairs to view an exhibit about its restoration, I was turned away from climbing further up into the dome to see the views . . . apparently, I had bought a ticket that did not include this feature. Oh, well. Hot, sweaty and very thirsty, I made my way through the gift ship to the outdoors — where the temperature was no cooler (or warmer). Thankfully, there is a small café outside the Berliner Dom where water can be purchased. After checking text messages, I headed to our Nuest’a rendezvous point — the Annette Görtz boutique. Back across the Spree and Bebelplatz, I am the last to arrive at the boutique. So many beautiful pieces of clothing in her fall collections. Unfortunately, it is impossible to look at — let alone think of trying on — wool and equally beautiful and heavy materials made into sweaters, coats and jackets.​​ Instead, Tejomaya, Zelda and I try several things on from her Spring/Summer line — tops, light jackets, pants. After making a few purchases between us, we are off to Zara (Friedrichstraße 88) and Massimo Ditto (Friedrichstraße 83) shops for a “younger clientele — about two-blocks away. ​With a couple of hours before our train back to Dresden, we grab lunch at a small café, pick-up our luggage, and wait for our taxi in the Regent Hotel lobby. 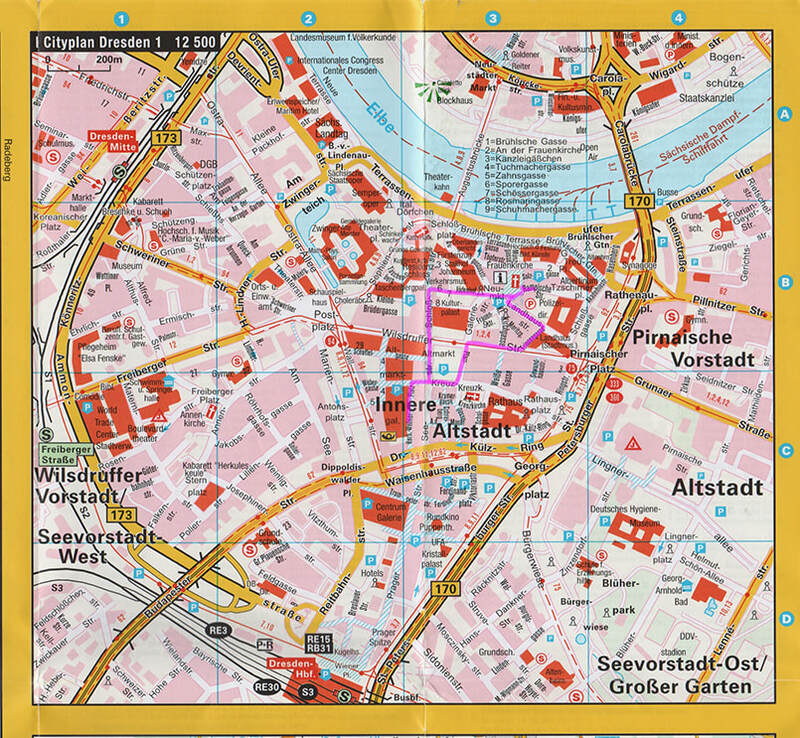 As the “crow flies”, the Hauptbahnhof is relatively close to our hotel. The drive is short — especially since we’ve become familiar with these streets over the past few days. Upon arrival, we take the escalator down to the designated platform, purchase bottles of water and snacks, and wait for our train to arrive . . . on time — another outstanding aspect of Germany is that it runs efficiently (and logically for linear-minded people)! Again, we are sharing a compartment with two others. Extremely warm inside, though the air conditioning is turned high. I drift between reading and dozing. As we near our train stop and are pulling our suitcases down from the rack above, an Asian family pushes their way inside our compartment creating a barrier for us to exit. Zelda slips by and heads off the train as Juli, Tejomaya and I wrestle our way past the newcomers. 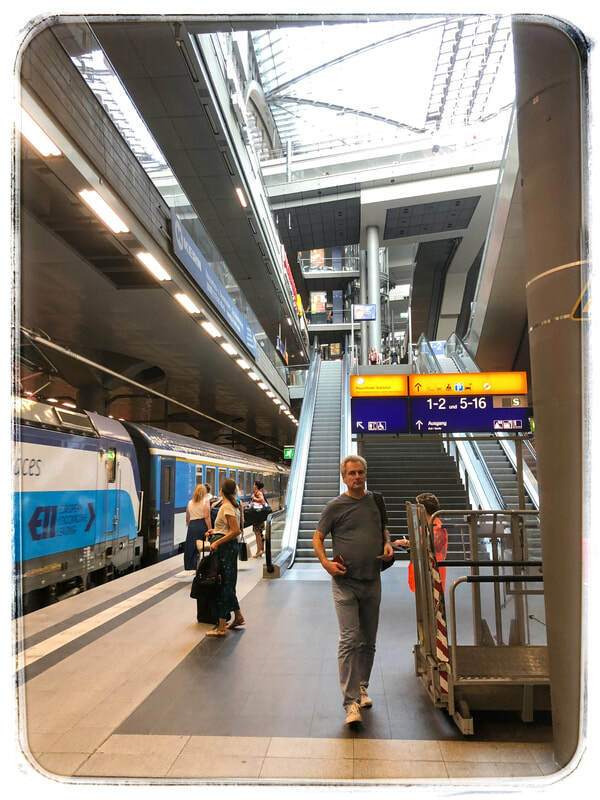 Walking as fast as possible in the narrow corridor towards the train’s exit, it begins moving — we watch incredulously as the train pulls out of the Dresden station with the three of us Neust'as still inside! Thinking quickly, Juli calls Konstantin, who is meeting us at the station, to tell him what has happened and look for her mom as she is the only one who made it off the train. As others queue up behind us at the train door, it is apparent we are not the only one’s who didn’t make it off the amazingly quick stop. Forty-minutes or more later, we disembark at the “next” stop at Bad Schandau. Bad Schandau is a spa town and only about 6 kilometers (less than 4 miles) from the Czech Republic border. In fact, this is exactly where we would be getting off had we time to do some hiking in the Saxon Switzerland National Park in the Elbe Sandstone Mountains. 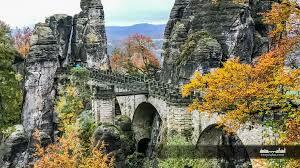 I had so looked forward to hiking around Bastei, the most famous rock formation in this area, and the Bastei Bridge, a 250-foot man-made bridge that connects the rock formations and offers 360-degree views, and remnants of old medieval castles. Another time! ​No sooner did Juli find out we can purchase on the train heading back to Dresden, than it arrived. More relaxed on our way back to Dresden, I can more fully appreciate the beautiful landscape and Bastei rock formations as we travel alongside the Elbe. I notice too, several people kayaking the gentle river and fly-fishing. Now I really want to return here — spa, kayaking, fly-fishing . . . what’s not to love here! 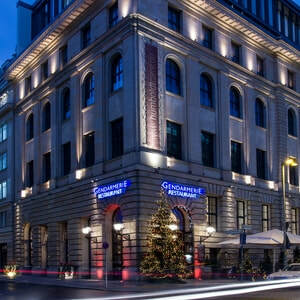 Once we arrive in Dresden, we hail a taxi to Hotel Suitess. 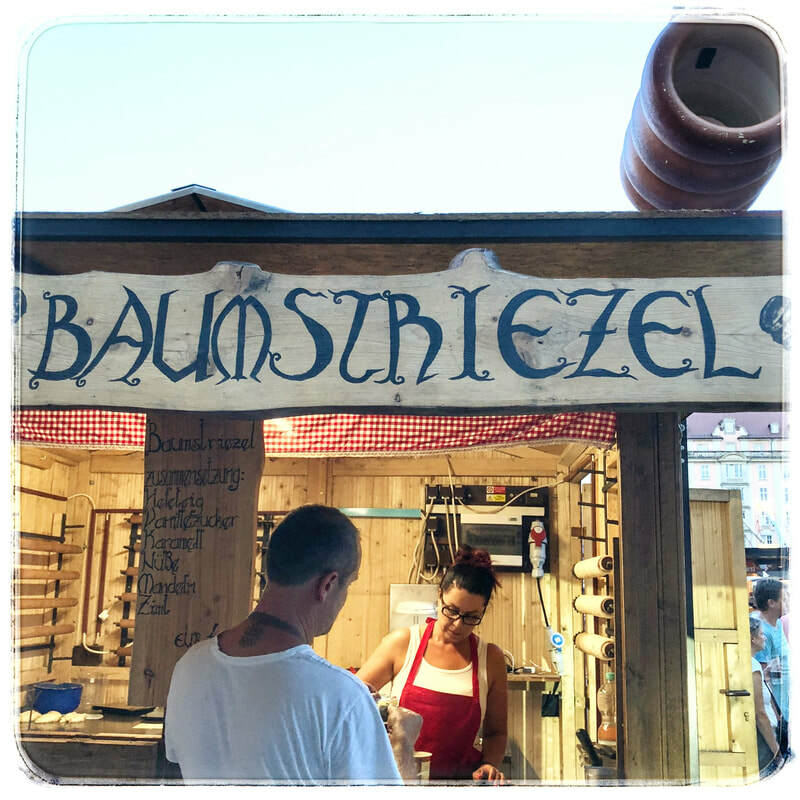 Our driver tells us there is a three-day festival on the Neumarkt — with food, beer and alcohol booths, entertainment, and cycling races that start/finish there each morning. Returning to my hotel room is like coming home with more than half of my things waiting for me. After a shower and change of clothes, we meet up in Zelda’s apartment to make a plan. Having sat on trains for several hours, we are all on board to take in the festival and eat Brats for dinner! This part of Dresden is so familiar as we check out the festival that sprawls from Neumarkt to Altmarkt. One stand offering mango lassi draws me in. Refreshed with the yummy-delish taste and beautiful memories of my trip to India earlier this year, I meet back up with the others as we check out where best to purchase dinner of brats and beers. Konstantine is our expert. Along our route, we watch volunteers make snacks for the cycle racers tomorrow. And, just as we are all getting really peckish, he pronounces that a booth at Altmarkt is worthy of our Euros. Served like a hotdog, the bread, for me, is merely the “plate” to hold the brat and keep the mustard from getting all over me. Curiously, they aren’t offered with sauerkraut, which I personally think would be a welcome addition in flavor! Place the flour in a large bowl, add yeast, sugar and salt. Mix in oat milk and melted butter. ​Knead into a smooth dough and cover with a kitchen towel. Let rest for 2 hours. Preheat the broiler of your oven to 250°C. Grease a rolling pin with butter and wrap the handles in aluminum foil. Divide the dough into three pieces. Roll one piece into a disc, 0.5 cm thick. Cover the remaining two pieces with a damp kitchen towel. Cut the dough into a spiral, so that you get a long string that is about 1 cm thick. Tightly wrap the string around the rolling pin. Brush with melted butter and generously sprinkle with sugar. Place the rolling pin over a baking dish so that the handles will rest on the edges of the dish but the centre of the pin with the dough wrapped around it won't touch the dish. Place under the broiler and bake for about one minute or until the sugar starts to caramelise and changes its colour to brown. Rotate the pin a bit and repeat. Bake and rotate until the cake is evenly browned. Carefully remove from oven. Cover with a kitchen towel and push the cake off the pin. Bake the remaining two chimney cakes. On the way back to our hotel, Zelda introduced me to honey covered almonds that were also addictive! 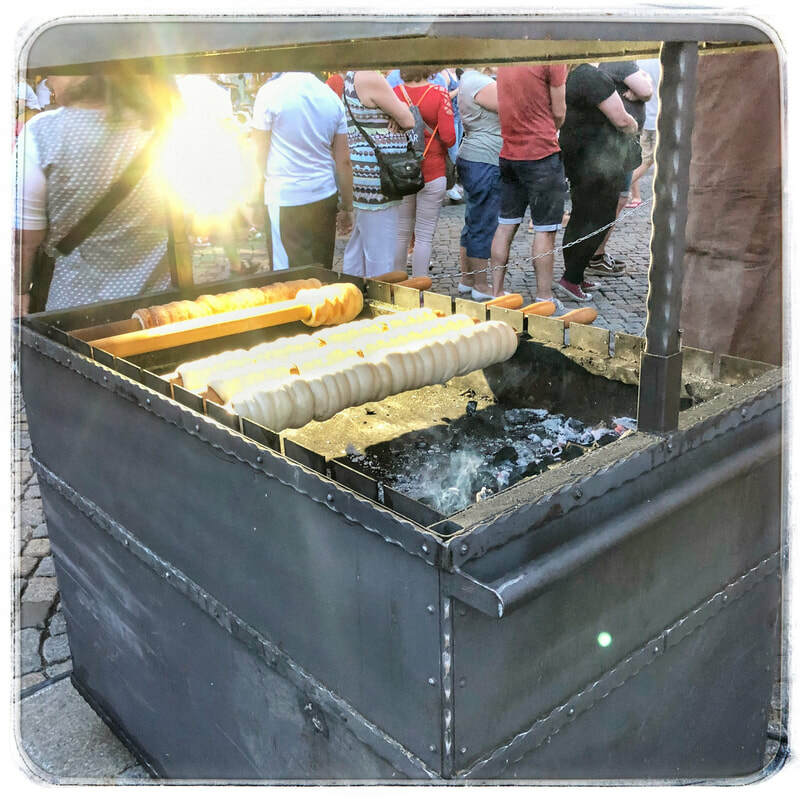 She also introduced me to a fried dough with powered sugar treat that is reminiscent of a Polish dessert my mother use to make once a year when my brother and I were young . . . Mrs. Axten’s Chrushiki, which was made with flour, egg yolks, salt, sour cream, 200-proof Polish vodka. 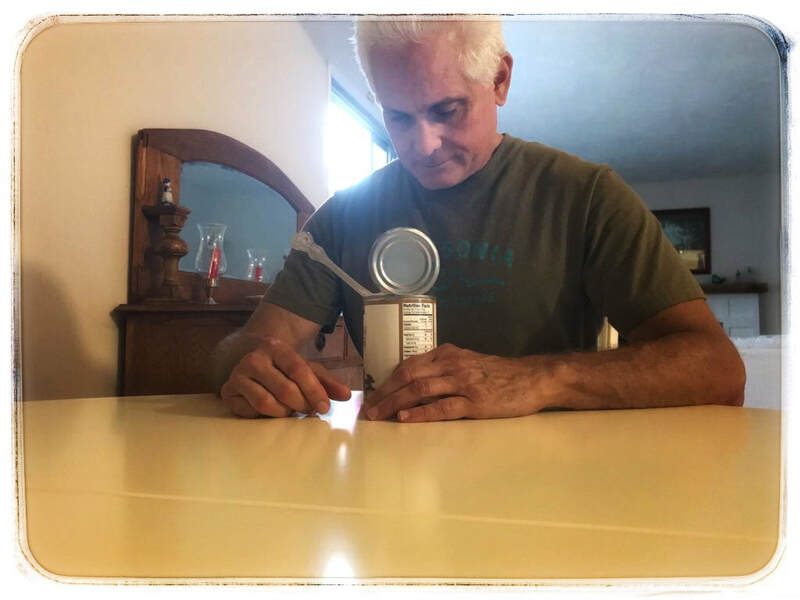 Relatives coming from Poland would bring my mother unlabeled bottles of vodka, which shewould hide away just for this recipe! The one’s we purchased tonight were good, but not nearly as attractive or tasty (most likely these didn’t have 200-proof vodka) ... Sorry no pics, as I was do busy stuffing myself! Back at Zelda’s apartment, we made train reservations for Prague before saying good-night. While unpacking my suitcase, the music outside in the Neumarkt turns to danceable rock music. Texting the Nuest’as, only Zelda was interested in joining me on the square for some fun! And, fun we had . . . dancing and singing to American songs we know and just dancing to one’s in German that we didn’t know. With drinks in hand, we had a grand time . . . staying past the main entertainment and until the clouds released more than a sprinkling of raindrops. By the time, we reached Hotel Suitess, the sky opened up into a downpour — lucky us!!! DAY 8: Musuem Island & Trippen . . .
Tejomaya and I were the first one’s up and out in search of breakfast, which we did at a sweet café — Amici — two blocks away from our hotel on the corner of Markgrafenstraße and Jaferstraße 56. Starving, I ordered a three-egg omelet with veggies and ham, a croissant, fruit and hot chocolate. Zelda joined us about 20 minutes later and we began making plans for the day: Juli was sleeping in; Zelda opted to spend the morning sitting at the café writing; and Tejomaya and I decided to explore Museum Island (Museumsinsel), which is the site to world’s must diverse, yet coherent, museum complex. Actually, there are five museums located on the Island that were built between 1830 and 1930 to hold the Prussian royal collections or art and archeology. Having been heavily damaged during WWII, the complex has been completely restored and was declared a UNESCO World Heritage Site in 1999. On our walk to Museum Island, we discovered an Annette Görtz boutique (Markgrafenstraße 42) and only a block away from our hotel! One of my favorite German designers, I first discovered Görtz clothing at Santa Fe Dry Goods (Santa Fe, NM) where I bought a fabulous raincoat designed by her. Known for avant-garde styling and a "non-color palette", her clothing and my personal style match perfectly. Not open yet, I made a mental note to stop by either later today or tomorrow! After crossing Bebelplatz, we walk towards the Deutsches Historisches Museum and turn left before crossing over the Spree River. After a couple of failed attempts to access Museums-insel, we find a way over Monbijoubrücke at the Bode-Museum. Located at the northern tip of the island, the Bode was designed by architect Ernst von Ihne and completed in 1904. 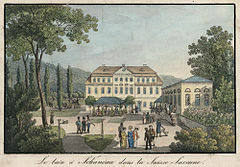 Originally called the Kaiser-Friedrich-Museum, it was renamed in honor of its first curator Wilelm von Bode. The Museum holds collections of sculpture as well as Byzantine Art, coins and medals. 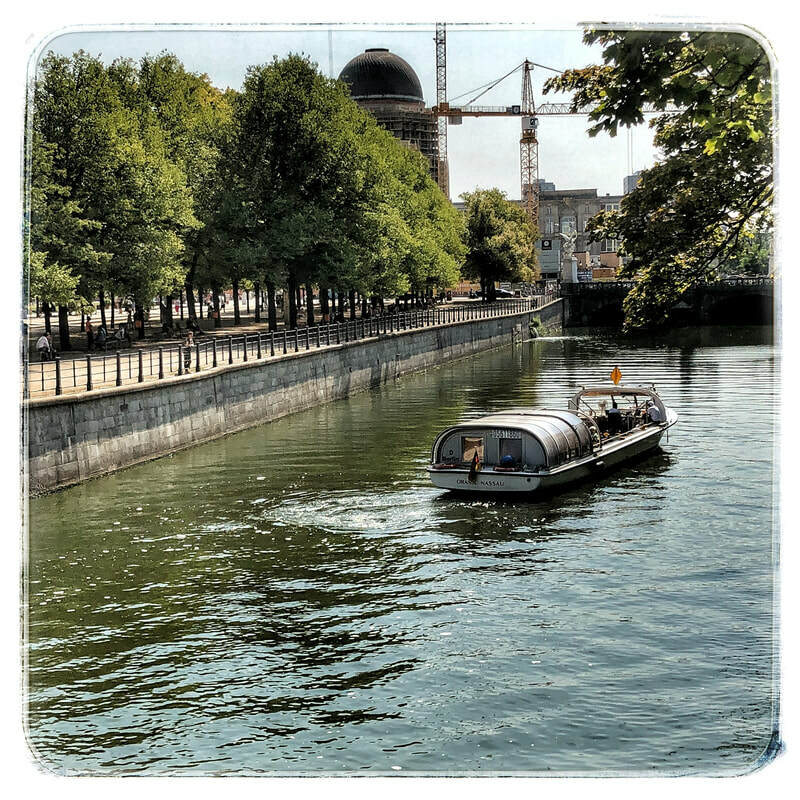 Hot and thirsty, Tejomaya and I left the Bode and continued across the Monbijoubrücke walking along side the Spree to Monbijou Park where we quenched our thirsts and sat for a few minutes people-watching. Next, we headed back to the island and the Alte Nationalgalerie (Old Museum) that houses an international collection of art from 1800 to the present. It is one of the major collections of the Staatliche Museum zu Berlin (National Museums of Berlin), with works located in various museums across the city. The Alte Nationalgalerie showcases 19th century art and its collections range from early Neo-Classical and Romantic period works to the Impressionist school, and holds the largest collection of paintings by Adolph Menzel in existence. Our next stop was the Neues Museum (New Museum), which was the second museum to be built on Museum Island (between 1843 and 1855) and houses the Prehistory, Early History and Egyptian collections including the iconic bust of Queen Nefertiti that we weren't allowed to photograph. My fourth grade teacher — Miss Petti — inspired in me a love of Egyptian art history and culture. One of my top bucket list trips is to visit Egypt and experience and soak in the energy of the Valley of the Kings and sail down the Nile River. Tired and thirsty, we opted out of visiting the Pergamon Museum once we saw the long line of people queued up in the hot sun waiting to get in. This museum was built over 20 years (1910-30) to house monumental artifacts such as the Pergamon Altar, the Ishtar Gate of Babylon and the Market Gate of Miletus. I look forward to spending long hours here on my next visit to Berlin as it also contains the antiquity, Middle East and Islamic art collections. So for now, I need to be content with seeing photographs of these wonders taken by others. 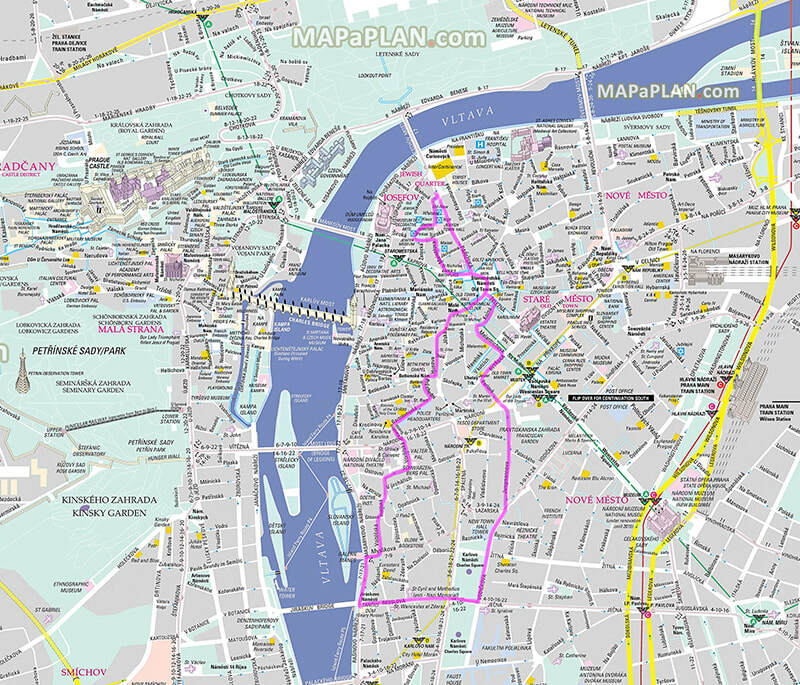 Instead, looking at our Berlin map, Tejomaya and I decided to weave our way across the Spree left on Burgstraße to MonbijouPlatz, then right towards Hackeschermarkt to the Trippen flagship store (Hackescher Höfe 4&6). On the same trip to Santa Fe where I discovered Annette Görtz’s clothing, I also discovered and bought an incredibly comfortable pair of Trippen boots — they are truly like wearing slippers, so incredibly comfortable. After trying on literally a score of sandals and shoes, I found my ideal ones . . . just not in my size. Disappointed, my quest is to locate them somewhere in the U.S. I’ll keep you posted!!! Absolutely tired, hot and sweaty, and having learned we have a 7:30 dinner reservation, we retrace our steps back to the Regent Hotel — passing wonderful graffiti along the way! Having put on many miles today, I was feeling good . . . after a hot shower, fresh clothes, two Moscow Mules! We opted to eat outside on their "summer terrace" (sidewalk) as it had cooled down pleasantly. Dinner was excellent. Being a "Chanterelle Week", I ordered Lobster bisque, followed by Chanterelle risotto and a side of Mediterranean grilled vegetables. Being our last night in Berlin, Zelda, Juli and I lingered over several glasses of Prosecco sharing personal stories and highlights from our time thus far together — beautiful evening! Again, before going to sleep my thoughts drift to how much I love Berlin and already I am looking forward to my next visit . . . or perhaps a longer stay. DAY 7: Falling in Love with Berlin! I woke this morning knowing that I am falling in love with Berlin. Like the start of many love affairs, it’s hard to single out one quality or moment . . . it’s just a feeling . . . an undeniable sense. Anyway, that’s how I felt as I came into consciousness this morning! Our general routine . . . once ready to start the day one of us Nuest’as texts the group to see who is up and ready for breakfast. This morning that was Cat, who needed to eat breakfast early before heading off to an interview that may well lead to a graduate fellowship as she begins her doctorate in art history. A few minutes later, Cat, Zelda and I are sitting in the Regent Hotel dining room enjoying a lovely breakfast and making a plan for the day. Simply, once Tejomaya is ready, she, Zelda and I will walk to the Berlinische Galerie to rendezvous with Cat. While Cat and I spend time at the modern art museum, Zelda and Tejomaya will go on the Jewish Museum. At some point later in the day, we four will meet up for dinner at the Fernsehturm. While waiting for Tejomaya, Zelda and I walk around the block to Bebelplatz. This plaza was once envisioned as the cultural and intellectual center of Prussia under the rule of Frederick the Great. Keep in mind that back then Prussia consisted of what today includes Germany, Poland, Russia, Lithuania, Denmark, Belgium, Czech Republic and Switzerland. By the time Zelda and I returned to the Regent Hotel, Tejomaya was waiting for us. With map in hand, we found our way to the Berlinische Galerie, where we met Cat for cool drinks of fresh limonade and iced kaffees. 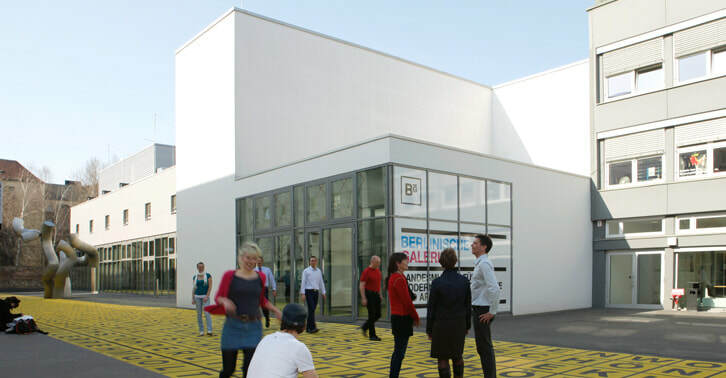 The Berlinische Galerie is one of Berlin’s newest museums and is focused on a museum of modern art from 1870 to the present, photography and architecture. Below are images or details from images that I found particularly interesting and inspiring. Several hours later, Cat and I met up in a room dedicated to a major work — “The Art Show” —by U.S. artists Edward and Nancy Reddin Kienholz. The piece was conceived and created from 1963 through 1977, and it became part of the Berlinische Galerie collection in 1996. Its theme is the opening of an art exhibition in gallery, and the installation consists of 19 figures, a number of collage-like works or art that depict the casting of bodies for the sculptures, furnishing and installing the gallery space, and electrical wiring schematics. All of the “people” in the installation wear clothing owned by those who were models. 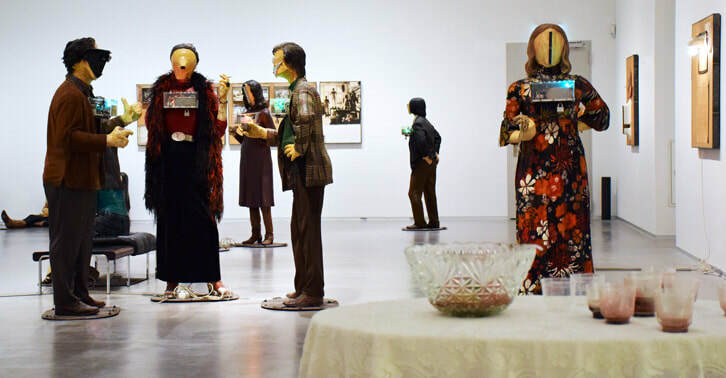 Their faces are replaced by air conditioning vents, fans from old cars, and when one presses a button on the figures, a comment on art by the “person” is heard above background noise from the imaginary opening reception. After leaving the museum, Cat and I stopped at a couple of private art galleries on Lindenstraße before retracing my steps back towards our hotel. We also ducked into a Miehle showroom — nothing new — and across the street a wonderfully colorful boutique of clothing and homeware by Gudrun Sjödén (Markgrafenstraße 32). Thirsty, we stopped at Gendarmenmarkt in the shadow of the Konzerthaus and the Französischer Dom for an iced kaffee, glass of Prosecco and some people watching! Back at the hotel, with about 30 minutes to shower and dress, we Nuest’as met in the lobby for a taxi to the Fernsehturm for dinner. 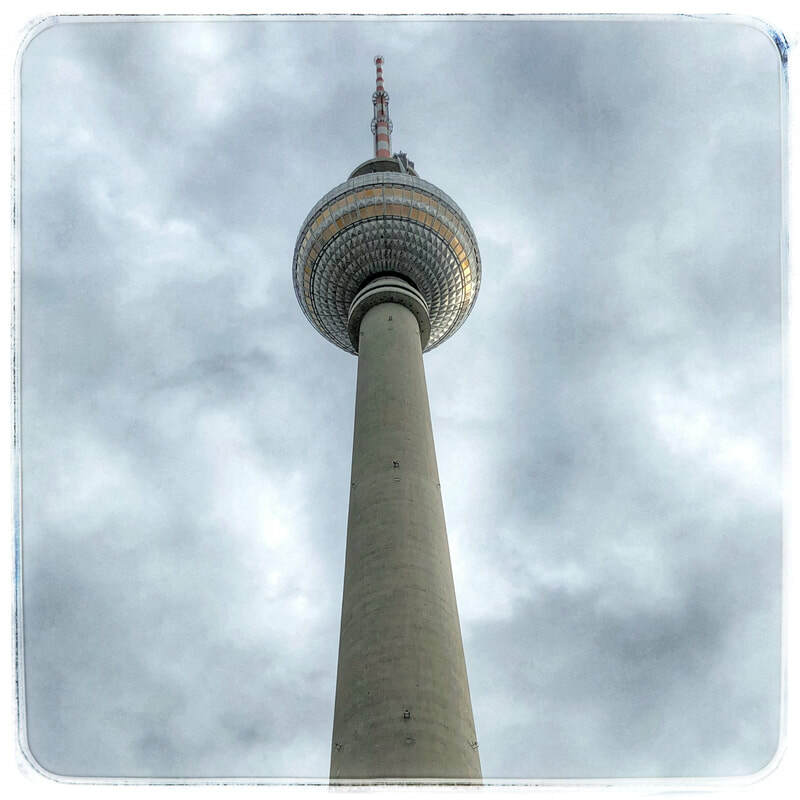 Actually a 1,207-foot high TV tower, it is the tallest building in Berlin. Like the Seattle’s Space Needle, it affords incredible 360-degree views. It was built in 1965-69 by the East German government to demonstrate their building ingenuity. Arriving right on time, it took another 15 minutes or so to figure out that we needed to purchase tickets to ride the elevator to the Sphere restaurant and then queue up with everyone going to the observation deck. Thankfully, they held our reservation and we were directed to walk up a flight of stairs to the restaurant. The food was surprisingly tasty, as were the drinks . . . and the view was incredible as the restaurant slowly revolves around its own axis every 30 minutes. This was a perfect way to orient ourselves to our hotel, where we’ve already been and where some of our next destinations were situated. 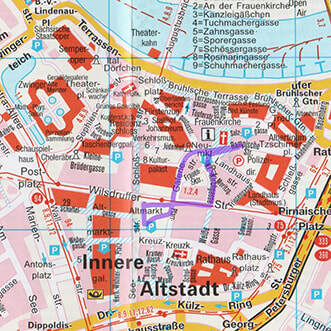 Having realized how close the Fernsehturm is in relation to our hotel, we opted to work off dinner by walking back. Our route took us over the Spree River and across Museum Island with nighttime views of the Berliner Dom, where classically-trained street musicians performed exquisitely. We crossed through Bebelplatz to Behrenstraßse and checked out two restaurants as possibilities for our last dinner here tomorrow night. As head hits the pillow, my thoughts return to my growing love affair with Berlin! My "nuest'a" name is Prism — and like my name implies, my passion and dedication lie in collecting experiences, internal reflection, and dispersing light in its fullest complement of hues.